If oddball films are to your taste (and if not, are you sure you're in the right place? 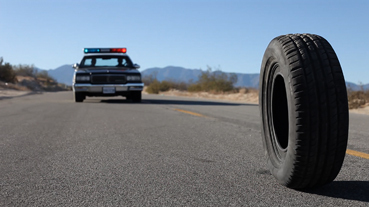 ), then how about one in which the lead character is a car tyre? And no, it's not a computer animated short but a live action feature. Intrigued? Good. Rubber is the story of Robert, an inanimate tyre that has been abandoned in the desert, and suddenly and inexplicably comes to life. As Robert roams the bleak landscape, he discovers that he possesses terrifying telepathic powers that give him the ability to destroy anything he wishes without having to move. At first content to prey on small desert creatures and various discarded objects, his attention soon turns to humans, especially a beautiful and mysterious woman who crosses his path. Leaving a swath of destruction across the desert landscape, Robert becomes a chaotic force to be reckoned with, and truly a movie villain for the ages. Directed by legendary electro musician Quentin Dupieux (Steak, Nonfilm), aka Mr. Oizo, Rubber is a smart, funny and wholly original tribute to the cinematic concept of "no reason." If you're looking to catch it on the big screen then there is a Flatpack Festival screening at The Electric, Birmingham on Saturday 26th March, a Celluloid Screams showing at the Sheffield Showroom Cinema on Tuesday 5th April, and a Midnight Movies presentation at The Ritzy, Brixton on Friday 8th April. Check with the appropriate venue for prices, times and bookings.